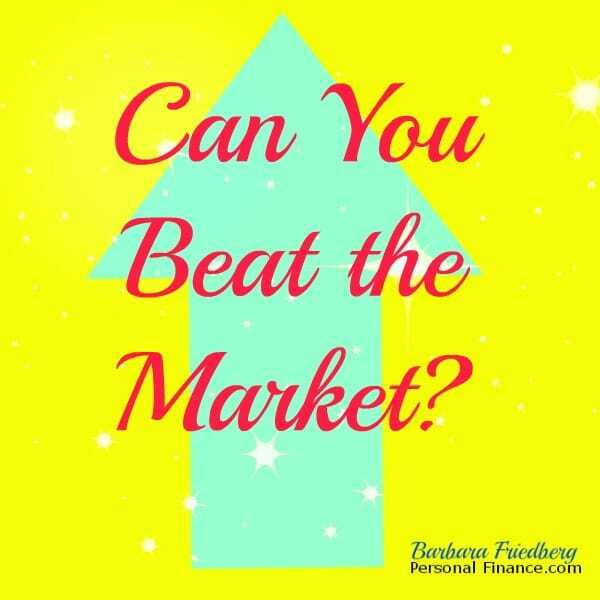 Can You Beat the Market? Is Index Fund Investing Overrated? After writing close to 700 articles for this website, occasionally, it makes sense to come back and update some of the older articles. In this case, we’ll go back to the index fund question and evaluate whether this passive investing approach can still beat the market. This article was originally written about 2 years ago. The inspiration for this post came from the New York Times article “Beating the Market, as a Reachable Goal”, written by Jeff Somer. In the article, Robert A. Olstein, insulted by the arguments in favor of index funds, claims that the index fund approach is a reach for mediocrity. Olstein goes on to site the stellar performance of his Olstein All Cap Value Fund (OFALX). According to the NY Times article, since inception (in 1996) through November, 2013, and including fees, the fund returned 10.7 percent annualized. According to Olstein, that was 2.4 percent better than the S & P 500 stock index. He also claimed his fund slightly outperformed the 10.3 percent return of Warren Buffett’s Berkshire Hathaway. Further, Olstein claims his out-performance was due to exceptional skill and analysis. To sum up, according to Ostein, his All Cap Value Fund beat the S & P 500 returns from 1996 to 2013. The above graph and chart, sourced from Morningstar.com on July 25, 2016, shows that the Olstein All Cap Value Fund’s returns failed to beat both its category peers and the unmanaged S&P 500 index during every listed category; YTD, 1 month, 1 year, 3 years, 5 years and 10 years. So, when this article was originally published two years ago, did OFLAX really out-perform the indexes for 18 years? It seems as though it’s common for active fund managers to describe their performance in a way that favors their active strategies over an index fund investing approach. In fact, in a recent IFA.com, article Tom Allen and Mark Hebner discussed claims by Olstein that OFLAX and their active investment management strategy was superior to a passive index fund approach. This IFA.com article also showed the flaws in the active management claims. In fact, the claim that all that’s required to beat the market with active management is to choose the right fund, is largely unsupported. Do Any Funds Ever Beat a Passive Index Fund Investment Approach? Especially over long time periods actively managed funds under-performed index funds. Actively managed funds closed more frequently than index funds. The actively managed funds with higher fees under-performed those actively managed funds with lower fee structures. There are exceptions-lower-fee actively managed large cap and mid-cap value funds outperformed the indexes 66.3% and 68.2% of the time over a 10 year period. Does the reality that a few managers may beat the market, recommend that investors should disregard the popular trend towards investing in index funds? Before jumping to conclusions, let’s consider the research in favor of index fund investing. Rick Ferri and Alex Benke took on an ambitious study of index funds. In “A Case for Index Fund Portfolios” (downloadable white paper) the authors’ completed an exhaustive study comparing the average performance of the market (as evidenced by an index fund investing approach) and that of actively managed mutual funds (using the survivorship-bias free CRSP database). This research compared active versus passive investing approaches in 5,000 simulated trials. How Were the Mutual Funds Selected? The CRSP survivor-bias-free US Mutual Fund Database includes objective investment styles and categories and is considered the gold standard data base of mutual fund information. The active funds, after being categorized, were randomly selected so that their asset classes mirrored those of the index funds. All funds included in the study were available and not closed during the entire periods of study. This article looks at a few of the researchers six scenarios. Scenario 1 included a three fund portfolio with taxable bonds: 40% US Equity, 20% International Equity, and 40% US Investment Grade bonds. This portfolio is a very popular asset allocation among investors (60% stocks: 40% bonds). In this scenario, during the 16 year period studied (1997-2012), the index fund portfolios beat the actively managed portfolios 82.9% of the time. Scenario 3 in their research study used Multi-Asset Class Portfolios and increased the number of asset classes. 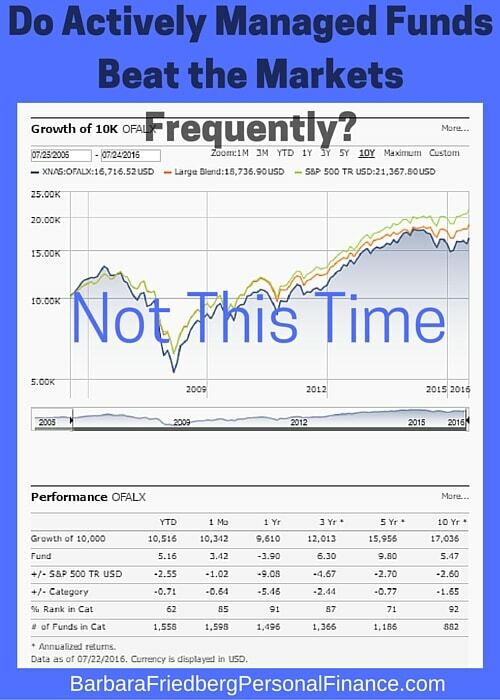 Only a 10 year period (2003-2012) was used due to the short life of several of the index funds. This scenario compared from 3 to 10 asset classes. The ten asset classes index fund portfolio beat 89.9% of actively managed fund portfolios using 5,000 simulated trials. 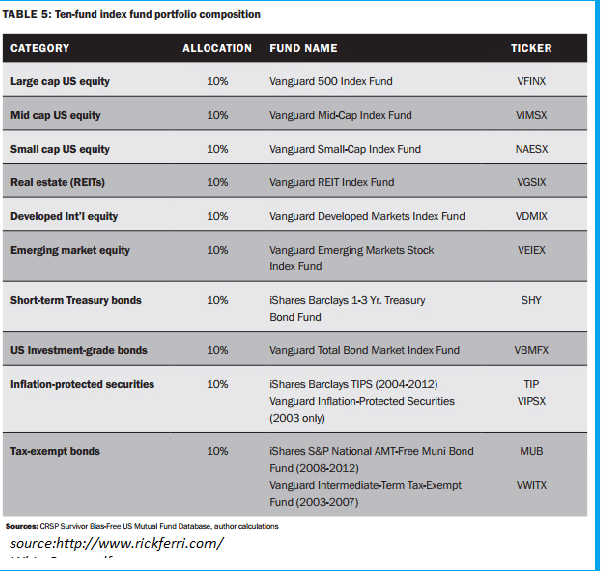 This chart shows the 10 index funds the research used for this analysis. The remaining scenarios considered a fee adjusted comparison along with a risk adjusted evaluation. I encourage anyone interested in this topic, to review the entire whitepaper. For the remaining readers, their conclusion regarding index fund investing versus active management followed that of Vanguard’s research along with that of recent Nobel prize winner Eugene Fama. The benefits of index fund investing continued over the various simulations. So what is the conclusion? We started with a description of a fund manager who might have outperformed the indexes during a specific time period. Next, we continued with an exhaustive study of index fund investing versus active management, under various scenarios. The results strongly favored investing with a passive index fund approach and to stop trying to beat the market. Does that suggest that everyone should invest only in index funds? Is Index Fund Investing Overrated? Can Active Funds Beat the Market? In response to question 1, “Is index fund investing overrated?” No. In response to question 2, “Can Active Funds Beat the Market?” Yes. So where does that leave the investor? Both Somer’s NY Times article and Ferri and Benke’s research agree, it is possible to beat the market, but it’s unlikely. Further, to add to the difficulty of beating the market is the reality that only know after the fact, will you discover which actively managed funds beat the market. Also, if an actively managed fund beats the market one year, doesn’t ensure that the same fund will continue beating the markets. Do we know for certain that the active portfolios which beat the market every year do so based upon skill and not luck? No, we don’t. What about those investors that want to attempt to beat the market? As an investor, you may want to take your chances at an active approach, just realize, that your chances of beating the market on an annualized basis, year over year are unlikely. Some investors enjoy stock picking and researching various assets. There are others who go for market timing, momentum, and other approaches. And what about the opportunity to invest in commodities and alternative asset classes? One investing alternative for those interested in attempting to beat the market; take a small portion of your portfolio, 5-10 percent or less, and try your hand at active management. If you beat the market, then you’ve increased your total returns. If not, then you haven’t sacrificed too much. In the end, the question remains, can a market beating return be explained by skill or luck? You may never know the answer to this question. What is your approach, active or passive investing? Does Olstein understand that comparing an “all cap value” fund to a broad large cap fund is completely irrelevant? Hard to take someone seriously when they don’t even know how to choose a suitable benchmark. My short answer is no, Index Fund Investing is not overrated. Most actively managed funds do not beat the major market indexes and that is all the evidence I need. Lower transaction fees and mgt fees make up for any benefit a fund manager may provide for most funds. There is always the exception but for most investors, index funds are the way to go. Great post. I fully understand the difference between active and passive investing. For my own opinion, I prefer active investing. It sounds more effective. Excellent debate…thanks for the well-written article Barbara. I believe active investing is a failure for most investors because they engage in market timing and momentum investing. They allow their emotions to influence their investment decisions, many time close to important market turns. They also try to “beat the market” on too short of a time horizon. Investors who base their investment decisions on valuation can employ a more active investing style. It does require more work and an ability to control ones emotions. Many investors are unable to do one or the other. Hi Ken, I agree that a more sophisticated investor may want to tweak the traditional index investing approach a bit. For example, at the trough of the market during the most recent recession, I invested some additional cash into my portfolio (existing index funds in line with my asset allocation), in order to take advantage of what I understood to be attractively valued asset classes. Valuations do matter, but one can also just employ a strict dollar cost averaging strategy into index funds and yield excellent results (historically). Thanks for your thoughts. I personally do not like the downside of index investing. I prefer some cushion and not to go that far down like an index. In my opinion, it’s not about active vs. passive mutual funds; it’s about one’s goal, needed rate of return and how much will be invested each year for that goal to be achieved. The biggest failure is not in the funds a well informed investor chooses, but his/her behavior through up and down and flat markets. More investors suffer big losses in returns due to a lack of discipline, asset allocation, and not being in high quality funds for longer than 5 years. According dalbar investors average annual return is about 3.5% a year. If investors were more disciplined and focused on asset allocation I think anyone can get to their financial goal. I personally prefer active mutual funds through a broker. Yes there extra fees, but in the long run, over ten years those fees are very low. I’ve had annualized returns of 17% for the last 7 years, and continue to pile in the cash each year. I focus on ten year performance and my asset allocation, more and staying disciplined to that asset allocation. I give the funds that I invested in time to compound and grow each year. I rebalance about twice a year, dependent upon the market and where my asset allocation sits verses my target asset allocation. Always bringing it back to the target allocation. Thanks for your opinion. I’m curious about the funds you have chosen as well as your asset allocation. A 7 year average return is quite impressive, especially given the -38% return of the S & P 500 in 2008. Although most active investors fail to beat the market averages, obviously some investors do prevail. Write in and share your asset allocation and fund choices. Let’s continue the conversation. Right now I am a little overweight in growth and income and building an over weight in growth. @Socrates, Thank you for giving the readers a peek into your portfolio. It looks as though you’ve given your asset allocation and funds a lot of thought. We wish you continuing out-performance over the years. Keep us posted!